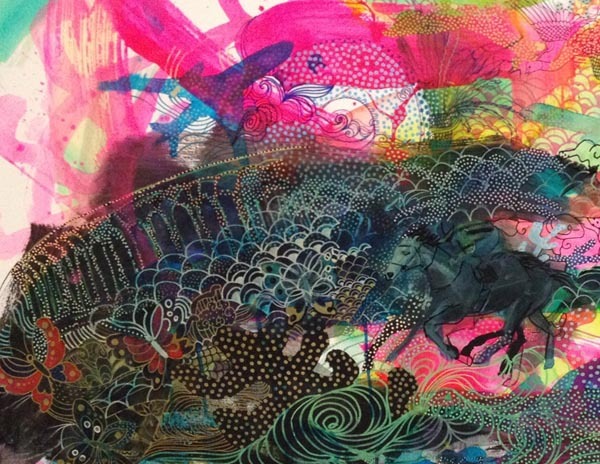 Detail of artwork design by Wakana Kimura. The work is part of the Metro Through the Eyes of Artists poster series, which commissions local artists to create original artworks that express the uniqueness of Los Angeles County neighborhoods, as a way of encouraging people to take Metro to explore new destinations. Four artists have designed new posters for the Metro Through the Eyes of Artists series highlighting Metro accessible destinations. One of the artists, Wakana Kimura, discusses her original artwork celebrating Inglewood and what she hopes to share with transit riders who see the poster on Metro buses and trains in the coming months. 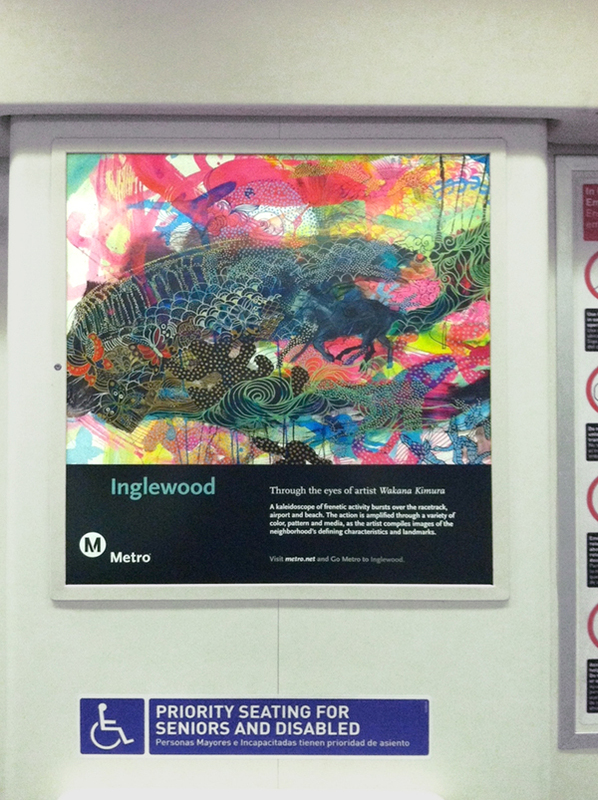 Inglewood poster spotted on a Red Line train, part of the Metro Through the Eyes of Artists poster series. 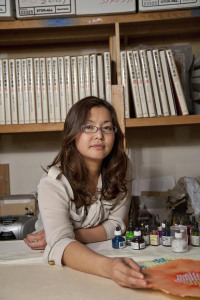 Wakana Kimura in her Inglewood studio. What is your connection with Inglewood and how did you choose this imagery to represent the city? I had my studio in Inglewood while I was a student at the nearby Otis College of Art and Design. For this project I wanted to translate the environment of Inglewood, the experience of the place. I felt a circular energy there and wanted to capture that. You were inspired by the circle form as you approached your poster design. Can you elaborate on that? Circles and dots permeate my work. After I was awarded the poster project I began my research and drove around the area. One day last year I was visiting the Hollywood Park race track and parked so I could make some notes. I had just stopped by Randy’s Donuts—next door to my former studio—and was sitting in my car, donut in hand, when there was a solar eclipse! Earlier, from my vantage point underneath the LAX Airport flight path, it appeared that planes were flying through the big donut (Randy’s). The cycle of planes taking off and landing was itself a form of circle. So the circle became a dominant motif in my design for the poster. Also, LAX was my entry point into LA so I wanted to include that imagery. When I see planes landing I wonder where they’re coming from. Maybe from Japan. Inglewood: a myriad of activities. I see an excitement in the city. When I ordered a donut, it became my megaphone, amplifying variations of sound that reflected the oval racetrack, the flight path of the airplane above and transcended to the eclipse and then bounced back to me, my shadow and the oval shadow of the donut in my hand. In my artwork my tools are ink, brush, pen, sharpie, my fingers, the edge of a piece of paper. I studied oil painting on canvas in Japan but now I prefer working on paper. With paper I have to take responsibility for every mark I make. Paper is less forgiving than other surfaces. But I view all marks as adding to the harmony of an artwork. I desperately try to create beautiful objects. I try to draw something beautiful again and again every moment, but my sense of beauty is always changing. I try to craw something beautiful; however, I realize that it is impossible to make something permanently attractive. Every day I draw till I feel satisfied, but it looks totally different the day after. I learned my feelings and sense of value were not concrete and I myself cannot trust my own sense of beauty. I critique my sense of beauty in the moment. Thus, my pursuit of beauty and in the moment started, and this pursuit will keep me creating forever. I’ve never had a painting move around. I wanted to translate the energy of Inglewood onto paper and now the poster is literally moving around! It was important to include literal and abstract elements, and for the imagery to remain accessible to anyone looking at it. I see myself as an interpreter through color. Language isn’t stable anyway. Painting can express more than my words.